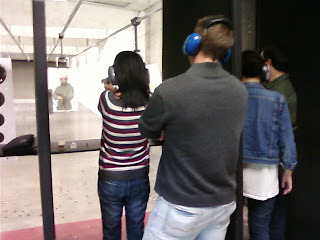 I went to a shooting range yesterday with some friends because it was ladies night at Wade Shooting Range. This is the first time I have ever been to one and it was a very interesting experience. The paperwork was actually extremely easy, you just fill out a form with your address and what nots and give them a driver license to keep for the gun. There were 2 guys and 4 girls in our group and the guys knew what they were doing. So they picked the guns. 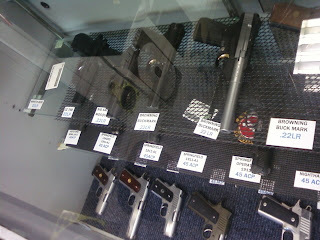 The guys, being extremely enthusiastic, picked a Glock 45, a Springfield 1911 and a Beretta 22LR (for us girls ). Then we had to pick out our targets. 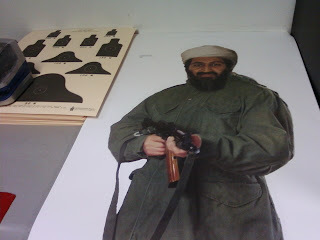 The guys very sensibly picked some round targets with points on them while we picked Osama Bin Laden because we thought it was hilarious. 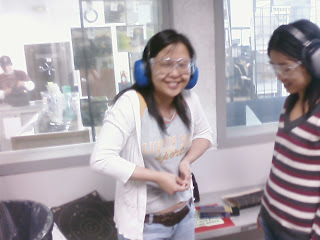 After we picked the guns, we put on the earmuffs and safety glasses and went in. NOw I was already warned about how loud it was going to be, but I was still totally surprised at the noise guns generated. For the first 10 minutes, everytime a gun went off, I literally jumped. It was actually really scary. I don't think the earmuffs were very sufficient either cause my ears are still ringing right now. First, I Tried the Beretta 22LR, the guys picked this one because it has the least recoil, it is practically an air gun and it felt like it too. It was very light and I can mostly hit where I want to hit. When you are shooting that gun, it doesnt' quite impress on you the power a handgun possess. But when I switched to the Glock 45 it was a totally different story. The glock 45 is a much heavier gun. I think it is a popular police weapon. The recoil was soo bad that I can't fire more than 3 shots before my hand start hurting. and I absolutely had no aim because everytime I fire, my hand shoots upwards toward the ceiling and I have no idea where the bullet went lol. FOrtunately I didn't seem to hit anything inappropriate. When I was firing, the bang was so loud that earmuffs was virtually useless. I don't understand how people do it without earmuffs on the outside. There is so much power in this gun that it really really made me feel that this is indeed something that can tear through flesh and kill a person. It was awe inspiring. I then tried the Springfield 1911, this is a really old gun. It looked like something out of the movies. My friend said that it was old and reliable. It is kind of in between the 22 and the Glock in term of recoil. Actually I think I liked this one the best, it still felt really powerful but not so much that it feels out of control. When I was shooting, I had this urge to just empty the clip really quickly because it felt so good. I refrained tho because I can't quite trust my arm to hold me through all the recoils lol. All in all, it was quite an experience handling weapons of small destruction. Throughout the entire time I had kind of an unpleasant feeling knowing that any of these guns are build for one purpose and that is to kill another person and to do it so easily, just gently squeeze the trigger and it is done. It kind of makes me want to hide. Not sure I will go back again.